Do you ever wake up on a Sunday morning and the only thing on your mind is a big fluffy pile of hot pancakes for breakfast? The other morning I woke up and I could practically smell them. 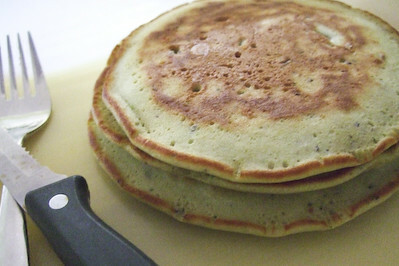 I was in the kitchen in a flash whipping up a bunch of these matcha and chocolate pancakes. 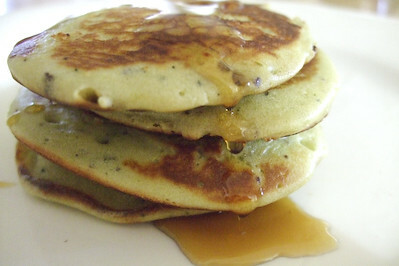 A bit naughtier than your regular pancake, the bitterness of the green tea is offset by the lovely sweetness of chocolate chips. And the recipe is so bloody easy, it's good for those days when you really can't be bothered using multiple bowls and whisking up egg whites for those fiddly lemon souffle pancakes. Sift flour, baking powder, matcha powder and salt together in a medium bowl. 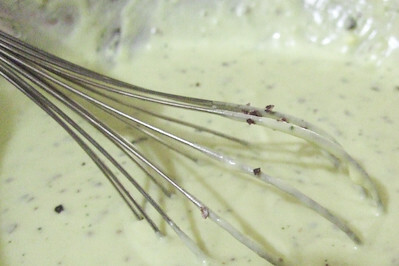 Form a well in the centre and whisk in egg, butter, milk, sugar. Stir in chocolate chips. Heat a small frying pan on medium heat and melt a small sliver of butter in the pan. Pour either 1 tbsp of batter in the pan for small pikelets or 3 tbsp for a bigger pancake. Cook until bubbles appear on the surface of the pancake and it is starting to look dry at the edges, then flip and cook on the other side until golden. Serve on its own or with maple syrup. I love how easy this recipe is. The pancakes are still surprisingly light and fluffy, though I didn't have chocolate chips (chocolate does not last very long in my house) so I had to substitute it with cocoa nibs which was less fun as they weren't melty and were quite bitter. White chocolate chips would probably be the best because they are a lot sweeter. At first I started off making them as little pikelets which were very cute, but by the end I was in a rush to go out so I got lazy and made some big pancakes. I actually preferred the texture of the big pancakes as they seemed to be fluffier and crisper on the outside, but they obviously take a little longer to cook than the small ones. Weirdly enough, I hardly ever eat savoury breakfasts anymore, favouring my toast, crumpets, scones or oats over eggs. So this was very satisfying breakfast for a sweet-toothed, green tea loving person like myself. I never knew that matcha = green tea powder! 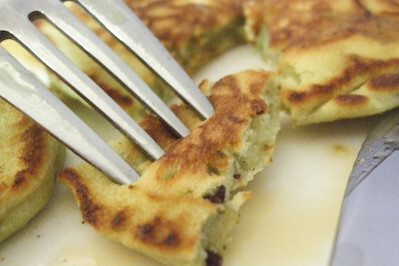 These pancakes look really fluffy - what a great idea to put chocolate chips in them! YUM! 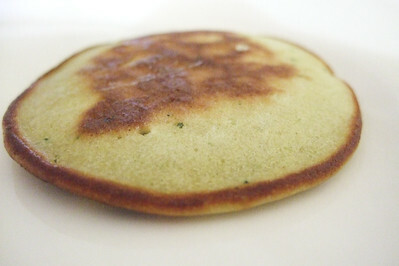 matcha pancakes! omg why didn't i think of that? i find i veer more towards savoury breakfasts than sweet these days. oh dear, a sign of getting old mehinks! I always want pancakes for breakfast!!! I like your additions! 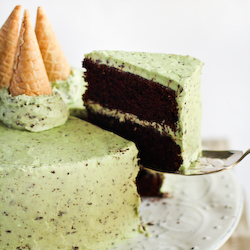 Mmm, matcha and chocolate are a match(a) made in heaven! And small pancakes are the cute, but like you said, big ones are pretty good too. I like the mix of bitter and sweet! A one-bowl recipe sounds perfect too. I dont think I've ever tried matcha before, but these look so fluffy and delicious....its 9.45 at night and I want pancakes now! how will I sleep tonight?!!? This sounds amazing. What a great combination - for breakfast! I love how the humble pancake has been transformed! What a clever idea!!! Will definitely try this out one weekend for a hearty Sunday breakfast! Helen - Ooh you should make matcha hello kitty pancakes! I went through a phase of loving savoury breakfasts, it comes and goes! Arwen - I love one-bowl recipes too, they were a life saver before I had a dishwasher! Maria - you should try it sometime, it grows on you! matcha kit kats from Japan are my favourite. Julia - Hehe thanks! 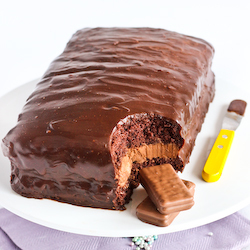 It's a little bit naughty but so worth it! 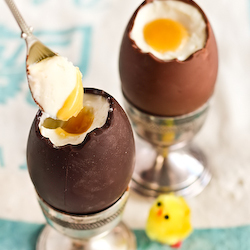 Trisha - It's so good for a big weekend breakfast! :) Thanks! Macha and choc chips, both I like! Great pancake idea. When I'm with the boyfriend, Sunday is pancake day. 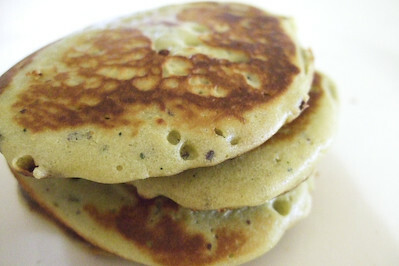 Love the idea of using matcha and choc chips in them! Ellie - :D Thanks! I'm a big fan of both too! Yas - Hehe thanks! 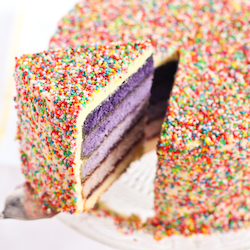 Ooh yum! I love Tokyo mart, it so full of goodies! Mm will definitely try it with red beans next time!